He was born in the town of Shumen, Bulgaria, in 1971. He started taking music lessons at 7. When 13, he was enrolled in the Varna School of Music, the Dobri Hristov National School of Arts, where he continued his education. In 1989, he completed his secondary education at Ruse-based Prof. Veselin Stoyanov National School of Arts where he specialised in viola in the class of Georgi Naydenov. In 1990, after emigrating to Turkey, he continued his higher education at the Izmir State Conservatory. In 1993, he was enrolled in the Robert Schumann Conservatory in Düsseldorf, Germany, in the class of Prof. Joachim Krist where in 2000 he completed his specialisation as a graduate with honours. During the same period, he started working as a conductor by taking lessons from Prof. L. Herbig and later he continued his education with maestro Dimitar Karaminkov. In 2002, he participated in the conducting master class in Sliven, Bulgaria, where he conducted the final concert. And in 2005, he again received an invitation to conduct a concert of the symphonic orchestra in Sliven. In 2010, he was enrolled to the Izmir State Conservatory in the conducting class of maestro İbrahim Yazıcı wherefrom he graduated in 2014. 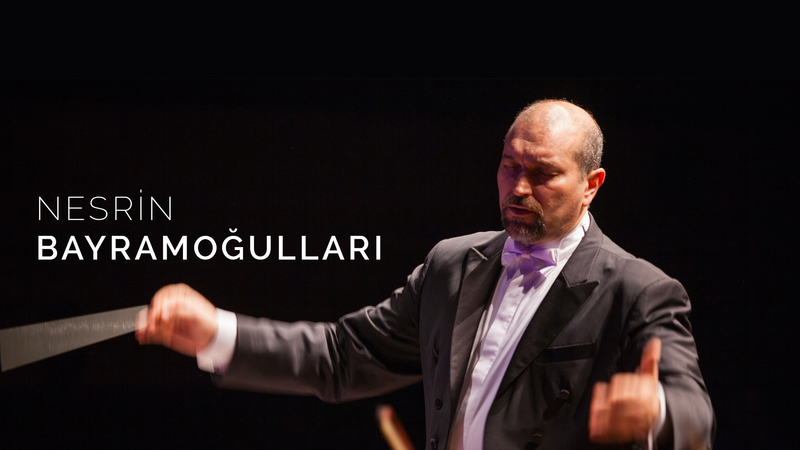 During his education, Nesrin Bayramogullari had multiple appearances as a conductor of state symphonic orchestras in Turkey as well as at the state opera in Izmir. He is also the conductor of the academic orchestra to the Izmir State Conservatory. In 2009-2010, he participated in a concert of young conductors with the symphonic orchestra of Antalya, Turkey. In 2012, he conducted the Izmir Festival Orchestra at the official opening of the film festival in Izmir. Since 2012, Nesrin Bayramogullari has been conducting the Bodrum Chamber Orchestra as well as works with the Izmir Chamber Orchestras and the chamber orchestra to the Antalya Philharmonic Society. In 2012, he was invited to conduct the academic orchestra of the Izmir State Conservatory where he has been working to this day. In 2013, he was invited as assistant-conductor in the Izmir State Opera, where he conducted the ballet performances Sylvia and Giselle. Apart from his concerts with the state symphonic orchestras of Adana, Antalya and Izmir of 2012, Nesrin Bayramogullari held the general education concerts of the Izmir State Symphonic Orchestra. Between 2012-2015 Bayramoğulları conducted student concerts of İzmir State Symphony Orchestra, and he has been working as the conductor since the begining of season 2016/2017. He has been going on with his performances of national and international concerts since 2015 together with the world-wide famous conductor Maestro Alexander Rahbari.